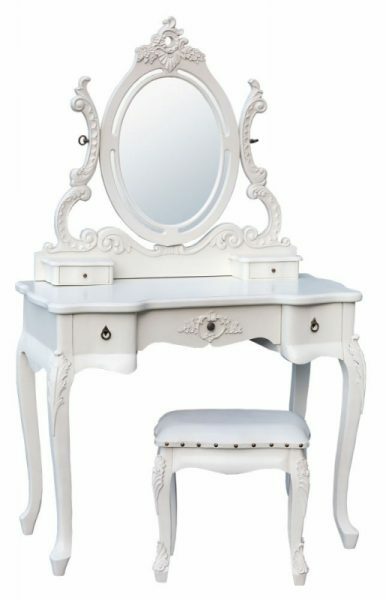 Fabulously ornate, the White Dressing Table, Mirror and Stool would look stunning in a traditional interior. Perfect for holding your make up and jewellery, it features a delicately distressed exterior with heavily carved detail around the mirror and legs, plus drawers for your accessories. This piece would make a lovely addition to your bedroom or dressing room. – Beautifully hand crafted Antique White Dressing Table Set. – Dressing Table with 2 small and 1 large drawer, Mirror & Stool. – Delicate embelished detail with a smooth finish. – Complete the look with other items from the range.